Xpansul’s sound as a dj is Techno, his sets are a journey through electronic music, in which the “axis” Detroit-Chicago-Berlin is the driver and all his other musical influences are the passengers. He’s playful and distinctive clockwork technique with the decks and mixer is well known and recognized. Since 1998, Santi starts writing and producing music as well, getting a really good response from the crowd and critics to his first releases on labels such as Audiodrome, Options, Isoghi, Syl.Label or Soundplant, sometimes working solo and sometimes with his partner Daweed. 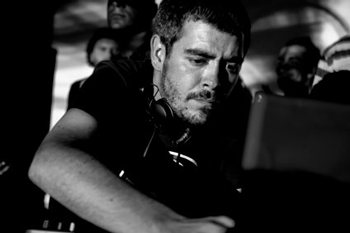 In 2003 Xpansul starts his own labels Discos De Lata and MSX manged along Daweed and Miguel Mendoza respectively, which took him to a solid position as a producer and label manager on an international level, thanks to the success achieved by releases on this labels and other releases on Software Records, Sindicato Records and Random Dynamics. And it was back in 2006 when Xpansul met well respected producer Alexi Delano and they started a series of collaborations, both original tracks and remixes, that have been put out on labels such as Plus 8, Truesoul, Frankie Recs Trapez and Leftroom, taking Xpansul one step ahead in his career. Alexi has always been one of Xpansul’s most important influences and sources of knowledge and inspiration. From then on Xpansul starts spreading his dj skills all over the world and receiving a warm welcome everywhere he goes. All this, added to his releases on Ovum, Soma Quality Recordings, Ad Ltd., Minuendo, Synewave, or his own Discos De Lata confirmed Xpansul as a true solid value in the techno scene worldwide. In 2009 Xpansul opens new label, True Type Tracks, along Daweed, where besides releasing his own works, Santi has been committed to the discovery of new talent. That same year, Xpansul joins W0RKT34M, a multimedia project created by Martín García Blaya and STEEL5000, where he collaborates with the production, mixing and mastering of their musical duo Loud Neighbor. In 2011 Xpansul moves to the island of Utila, Honduras, where he keeps delivering quality releases and remixes all over the Globe, on labels like H-Prod, Sleaze Records, Illegal Alien, Cuatro Records, Monza Ibiza, Analytic Trail, Minibus, Weave, Amazone Records, Clutch Trax, Unknown Territory, W0RKT34M, Nonpop, … And, of course, he’s own True Type Tracks. Xpansul is also an active promoter, making monthly True Type Nights parties and other special Techno events in Utila.